It has been a forgettable season for the Atlanta Braves, who begin the week at a league-worst 44-74 and 26 games behind the first-place Washington Nationals in the National League East. However, they'll host a notable series against the Nationals this weekend, wherein several promotional items and events are making ticket prices skyrocket on the secondary market. The Cleveland Indians have been one of the biggest surprises in the Majors this season, carving a comfortable lead atop the American League Central and poised for a playoff berth. They'll host the Toronto Blue Jays this weekend, and Saturday's game at Progressive Field will be the most expensive game this week. Indians tickets against the Blue Jays now average $186.66 and the cheapest ticket is listed from $33. The first 12,500 fans in attendance will also receive a Francisco Lindor jersey upon entering the stadium. A big weekend is ahead in Atlanta, where the Braves set to welcome postgame concerts and bobblehead giveaways during their four-game series with the Nationals. Saturday's game will be the most expensive of the weekend, as Tori Kelly sets to perform immediately following the game. As it stands now the average resale price for Braves tickets on TicketIQ is $186.39. If looking just to get in, the cheapest ticket can be found from $14. The series will begin on Thursday, and the first 20,000 fans in attendance will receive an Andruw Jones bobblehead. The figurine will commemorate Jones' wall-scraping catch against the Houston Astros on August 9, 1999. Tickets are currently averaging $168.14. Those looking just to get in are in luck, however, as tickets start from just $5 on TicketIQ. Friday night's game between the Braves and Nationals will serve as the fourth most expensive game of the week. Though no promotional items will be handed out to fans in attendance upon entering, the game still owns a $148.31 average on the secondary market. Tickets start from just $5. A fireworks show will be held following the game. Rounding out this week's top-priced games will be a Thursday matinee between the Chicago Cubs and Milwaukee Brewers at Wrigley Field. 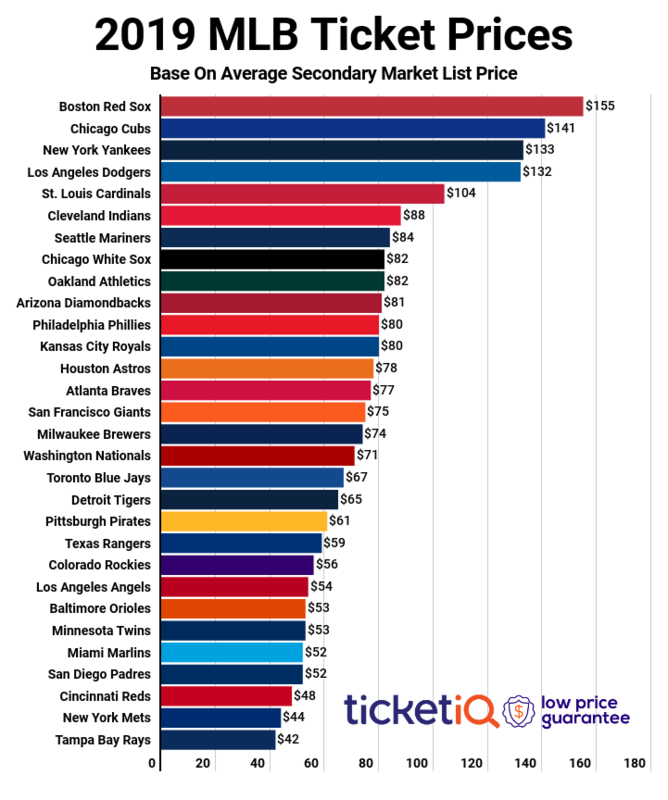 As it stands now, the average price for Cubs tickets against the Brewers on the secondary market is $147.28. The cheapest ticket is listed from $42. The first 10,000 early arriving fans aged 21 and older will receive a floppy reversible bucket hat.